Has another week of summer already flown by??? How can it be??? I go back to work in 5 1/2 weeks, so I need to make the most of it! Of course, that means getting down to some serious "stuff" makin'. 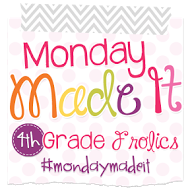 And who better to link up with than Tara at 4th Grade Frolics for her weekly Monday Made It link up? You can click the button below to head over and check out more fantastic ideas! Probably one of the most fun things I've made this past week has been slides for my new Heidi Swapp Lightbox. Once I figured out the template, inserting the pictures I was making and cropping them to fit each slide was pretty easy. My head is currently exploding with ideas for slides in my classroom. 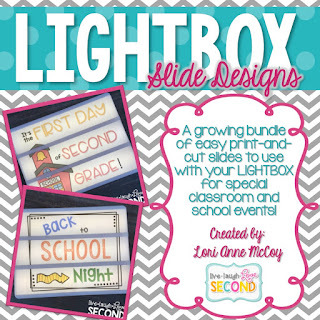 I uploaded a growing bundle of Lightbox slides to my TpT store. It's 50% off for this week only, and designs will continue to be added until it is full! You can check it out by clicking HERE or clicking on the picture below. You can also download this cute freebie that can be used for the days of the week. It's a pretty simple design, but it looks super cute on the Lightbox. Click HERE to download it or click on the picture below. I plan on doing a more in-depth blog post on how I make my slides, so check back! I had seen the pictures of the ABC Kraft Mac & Cheese floating around Instagram, so when I saw them at Walmart, I decided to pick up a box to use for my 3 year old. The letters were a lot small than I thought they would be, and I knew she would have a hard time manipulating them. So, I tried to come up with a way to use them in my classroom. I had my teenagers sort them into vowels and consonants for me, and then decided to dye them red and blue-like the magnet letters we have in the classroom. I used a 1/2 cup rubbing alcohol and SEVERAL drops of food coloring. I did mix the food coloring and alcohol together before pouring it in the bag. I read somewhere that it helps distribute the color more evenly (because you know...second graders totally care about that!). About every 30 minutes I would flip the bags, and after about 2 hours I poured the liquid out and put the pasta on a cooling rack to dry. They came out so vibrant and nice! I plan on using them as part of our spelling station this year. The kids will love them! I love using community supplies in the classroom. I know a lot of teachers (and parents!) don't prefer it, but it saves SO MUCH TIME. Over the years, I have accumulated more than a class set of scissors. That is what went in the community supplies at each table. If the kids brought their own scissors, they kept them in their personal pencil boxes. But...I started to notice that scissors from the community bucket would *disappear*. I really didn't have a way to hold tables accountable for their supplies because all the scissors were mixed up. Until...I saw this Instagram post from Carolyn at A Primary Kind of Life. Her scissors match her table bins! Come on, Lori!!! Duh!!! What a great way to hold my tables accountable! If I gave each pod their own color, they couldn't accuse another table of stealing their scissors. I had enough scissors in my personal collection to give 4 tables their own colors. Two tables will have share red scissors. Bummer for them. This is a more personal made it, but isn't it cute??? I made it using my Silhouette Cameo. Can't wait to put it on my girl. It's the first day of summer, and I hope you find a great way to enjoy it! See you next time! I, too, love my LightBox!! Thanks for the reminder about the community supplies - that will be my next item to make! :) Visit me at PJ Jots! I love the shirt that you made. I really think I need to invest in a Silhouette! I have not seen the Alphabet pasta. My Pre-K kids would love that! A great idea to put duct tape on the scissors!! Love the alphabet pasta! There's so many things you could do with it, and the kids will love it!